Why do marriages fail? While the answers to that question are many, and often complex, there is a growing body of research suggesting there are four risk factors that can hinder a relationship and increase a couple’s likelihood for marital failure. Crucial to the success of any marriage is for couples to eliminate or reduce the occurrence of these four risk factors. Previously we discussed Escalation* and Invalidation. * Now, let’s take a look at a third one – Negative Interpretations. Negative interpretations occur when one spouse consistently believes the motives of the other are more negative than they actually are. This kind of thinking can be destructive and diminish the feelings of affection spouses have for each other, while quickly eroding the intimacy in a marriage. When a marriage runs into trouble, repeated disappointments, arguments, and frustrations often lead to negative interpretations. For example, a husband’s perspective may shift from one of admiration to faultfinding. 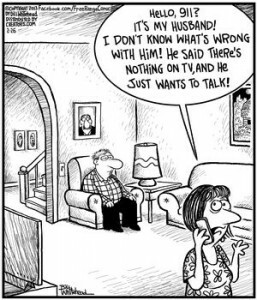 Then much of what his wife does is interpreted in a negative light and in his eyes she can “do no right.” These kinds of negative interpretations can be very harmful to a marriage. Or a wife may believe that her husband doesn’t want to be with her. As a result, she may criticize him anytime he is not enthusiastic about going out to dinner or to a movie with her. He may simply be concerned about the cost of going out, and whether or not they can afford it. She may consider his behavior as disliking being with her. The bottom line is we sometimes unwittingly switch “lenses” and see our partner negatively. And so we see the danger of negative interpretations. Research shows that in distressed marriages spouses often discount the positive characteristics of each other. When a relationship becomes distressed, negative interpretations can mount and create an environment of despair and hopelessness. Eventually, the negatively perceived spouse becomes demotivated and demoralized. People tend to live up or down to our beliefs about them. Negative interpretations about a spouse’s behavior or motives can create a “self-fulfilling prophecy”. Our partner will behave in ways consistent with our expectations. The Apostle Paul warned against attempting to judge the thoughts and motives of others, “So don’t make judgments about anyone ahead of time-before the Lord returns. For he will bring our darkest secrets to light and will reveal our private motives,(1 Corinthians. 4:5). Jesus challenged our thinking when He asked, “Why do you look at the speck of sawdust in your brother’s eye and pay no attention to the plank in your own eye?” (Luke 6:41). First, it’s important to realize you can take charge of your negative interpretations by “taking every thought captive,” (2 Corinthians 10:5). You must examine your attitude about your spouse’s motives. You may be surprised to find that they’re more positive than you’ve been willing to acknowledge. Take an honest look at your thoughts, ask God to help you see if your thinking might be overly negative, then with His help you can begin to turn them in a positive direction. Secondly, you must ask yourself if you are being overly negative in your interpretation of your mate’s actions or have a misunderstanding stemming from differences in your perspectives. Ask yourself, is my spouse intentionally forgetful and annoying or am I being more critical than warranted? Most people have a tendency to believe they’re doing the best they can. It hurts to be accused of maliciously doing something when you never intended to be hurtful. Listen to yourself and identify the negative interpretations. Consider what you are thinking with regard to your partner’s characteristics and motives. Do you give your spouse the benefit of the doubt? Is your thinking accurate? It’s possible there are alternative explanations for what your mate does. Third, push yourself to look for evidence that is contrary to your negative interpretations. Give your mate the benefit of the doubt rather than letting inaccurate, negative interpretations sabotage your marriage. Remember to look for alternative explanations, and more logical conclusions. We can accomplish this by either asking our mate directly, or by making further observations of our partner’s actions. Fourth, once you own the fact that what you repeatedly think and say to yourself determines your attitude and feelings, you can begin to replace your negative, irrational thoughts with positive ones and set your mind, your actions and your marriage on a positive track. You can begin to live out what the apostle Paul wrote to the Philippians (4:8-9): “Whatever is true, whatever is noble, whatever is right, whatever is pure, whatever is lovely, whatever is admirable-if anything is excellent or praiseworthy-think about such things … and the God of peace will be with you.” Replacing your thoughts may take some time, but stick with it and you’ll change your attitude, your feelings, and your marriage for good. Fifth, speak the truth, say it out loud. Begin doing this by selecting an aspect of your partner’s character you admire. For example: My wife Sue is a great planner. But, sometimes her desire to have everything all planned out can get under my skin and become the very thing that bugs me. However, I can train my brain and say to myself: “While this may irritate me right now, Sue’s discipline of planning is something I value deeply.” This kind of positive self-talk can change your atttitude and you’ll be amazed at how quickly you’ll feel a new sense of empowerment in your marriage. *Click here for the article: Why Marriages Fail: Invalidation, Part 2 of 4 by Roy Milam.